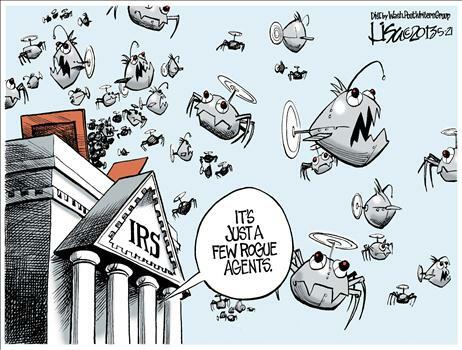 Call me perverse, but I’m enjoying this IRS scandal. It’s good to see them suffer a tiny fraction of the agony they impose on the American people. I’ve already shared a couple of cartoons on the topic, and I also posted a photo from my newest sports hero that captures how most of us feel about the least-favorite part of the federal behemoth. Now let’s enjoy some additional cartoons. 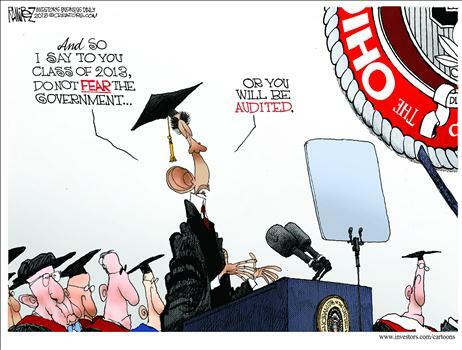 Let’s start with one from Michael Ramirez, which appropriately mocks Obama for saying we shouldn’t fear the government. Here’s Henry Payne’s contribution, which reminds me that the IRS actually expects us to believe they didn’t engage in political bias. And Ken Catalino suggests that the federal government treats Americans with the same suspicion and hostility accorded to terrorists. Though we should be happy that we’re not being targeted for drone attack. At least not yet. 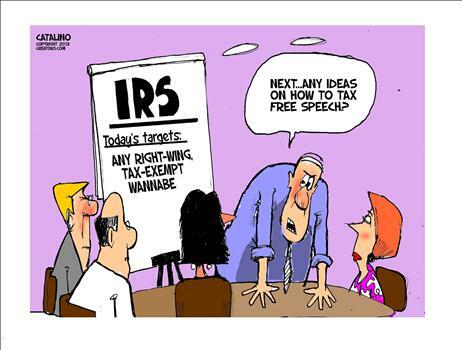 Speaking of targeting, here’s another Catalino cartoon that recreates a meeting at the IRS. 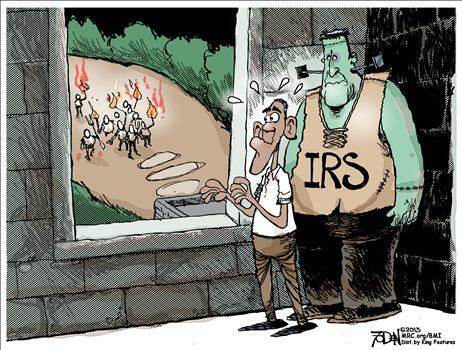 I like this Glenn Foden cartoon, if for no other reason that it would be nice to see taxpayers march on Washington to slay the IRS monster. 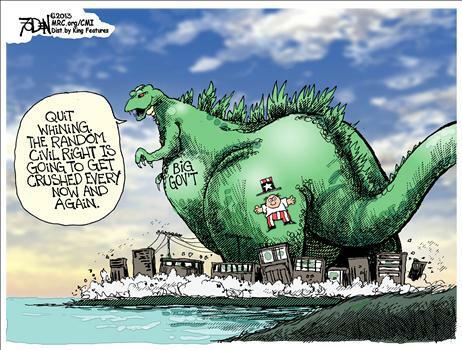 Here’s another Foden cartoon, which I like because it has the same theme as this Jerry Holbert cartoon, showing big government as a destructive and malicious force. These two Eric Allie cartoons (here and here) have a more charitable interpretation, implying that the damage is unintentional. Here’s another gem from Ramirez, winner of my cartoonist contest. 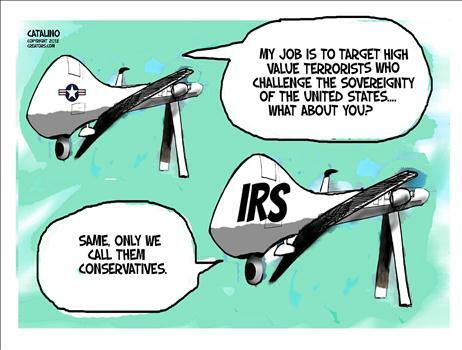 Lisa Benson weighs in with a cartoon on the army of drones. Sort of like this very good Glenn McCoy cartoon. 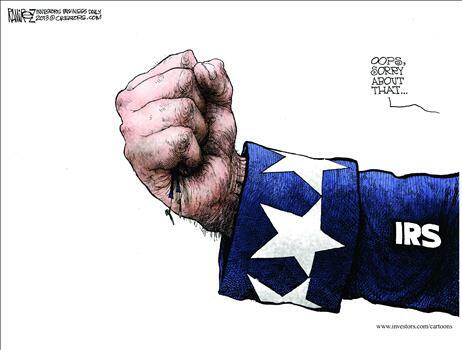 Here’s another cartoon from Henry Payne, showing Obama’s faux scolding of the IRS. Last but not least, this Chuck Asay cartoon may be the best of the bunch. 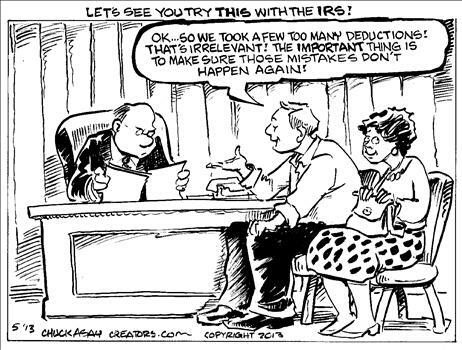 When we get in trouble with the IRS (even if we’ve done nothing wrong), we’re guilty ’til we prove ourselves innocent. Too bad we can’t exercise our rights, just like the IRS hack who just pleaded the fifth and refused to answer questions about her role in the scandal. 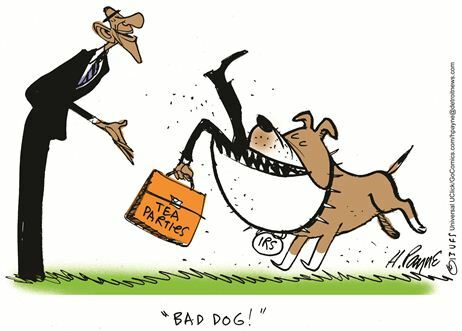 Now that I’ve shared all these cartoons, let’s remember that we should assign some of the blame to politicians. And I’m not referring to the President and the culture of corruption and Chicago-style sleaze that seems to be engulfing the Obama Administration. I’m talking about the constant legislative tinkering and the 74,000 pages of Byzantine complexity that has been created in the 100 years since the income tax was created. 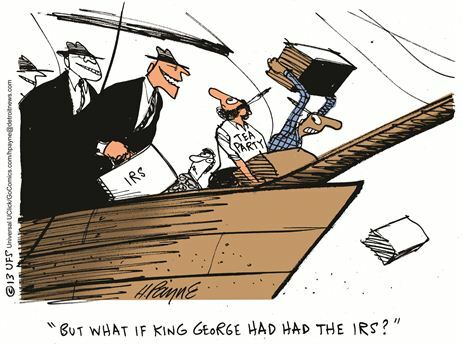 However, there are many reasons why the IRS bureaucracy deserves scorn. And it has victimizing employees. So let’s pass the flat tax, but never forget that a disproportionate share of bad people seem drawn to government. As a Georgian, you should check out the Augusta Chronicle’s Rick McKee. A brilliant cartoonist in the conservative vein.